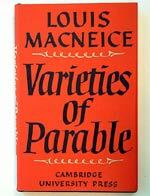 Louis MacNeice, Varieties of Parable. I. Compton-Burnett, Elders and Betters. St.- John Perse, Élogues and Other Poems. Dylan Thomas, Portrait of an Artist as a Young Dog. E.E. Cummings, 1 x 1.